McNeely & Lincoln Associates, Inc. (MNL) is an experienced landfill gas design firm with engineers specializing in landfill gas design. Today’s landfills have become more sophisticated with the utilization of bioreactor technologies, leachate recirculation, slope cap liner systems and the construction of renewable energy facilities which utilize the collected landfill gas. 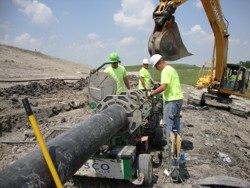 Additionally, with the EPA New Source Performance Standards (NSPS) requiring surface emission monitoring and increased reporting requirements for operators, a properly designed landfill gas collection and control system (GCCS) is vital to ensure compliance with state and federal regulations and minimizing site operational issues. Facilities that select MNL to prepare the landfill gas collection and control system benefit from a staff of professionals having numerous years of experience in the design of new systems and the extension of existing systems. Our staff understands the complex operational issues impacting landfill gas collection systems that utilize bioreactor technologies or leachate recirculation, and have a need to effectively collect landfill gas within the active portions of the landfill while minimizing the impact upon site operations. MNL is experienced with the various design requirements for landfill gas systems to accommodate the control means utilized. Design needs typically vary depending upon whether the system is intended to utilize a flare to control landfill gas or whether the gas will be directed to a renewable energy facility or an offsite customer now or in the future. Improperly designed systems require increased maintenance and potential costly upgrades which may be avoided by initially selecting a firm experienced in landfill gas design systems. If you are considering the installation of a new landfill gas collection and control system, or planning upgrades to your current system, contact MNL to assist you with the successful completion of your project. If you are reluctant utilizing a new firm to provide landfill gas design services for your facility, pleasecontact us for a list of references consisting of both Owners who have utilized our design services and contractors who have bid and constructed from our design packages.